I completed all of my holiday cards last month, or so I thought. Then I signed up for a card swap with a group of wonderful ladies so I figured I'd better get busy making some more cards. This is a low pressure swap. You can even use store bought cards. I have so many supplies, I can certainly make some more. So I'm reaching back into older stamp sets to see what I can do with them. This card is similar to others I've made and meets one of my main objectives this season - only one postage stamp per mailing. I was shocked when I bought my last book of stamps and it was nearly $10! I knew they had gone up but it still surprised me. Anyway, these with just one layer of cardstock and no trim shouldn't take any extra postage. 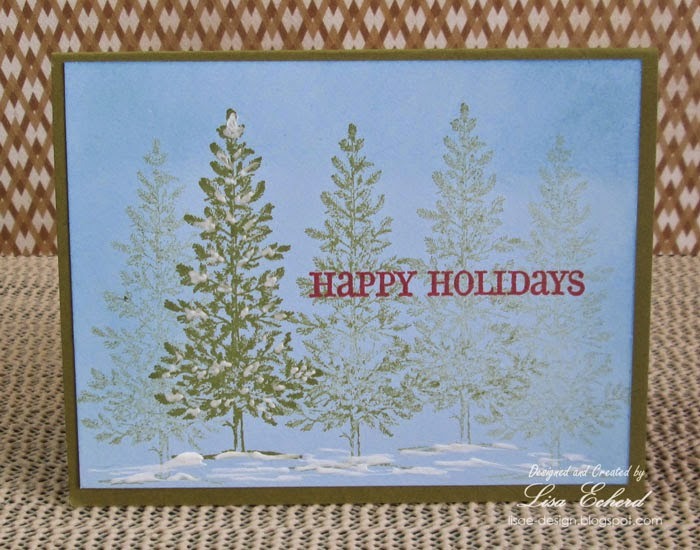 The card uses Stampin' Up's Lovely as a Tree set. You could use any single tree stamp. The green ink must be permanent though so the white puffy fabric paint won't mix with the ink and give you green snow - ick. Thanks for stopping by today. I'm grateful to all of you who read my blog and comment on my videos! I am going to have to get me some of that 3D fabric paint. Very cute, Lisa. Love how quickly this can be done. And "Lovely as a Tree" is one of my favorite sets.